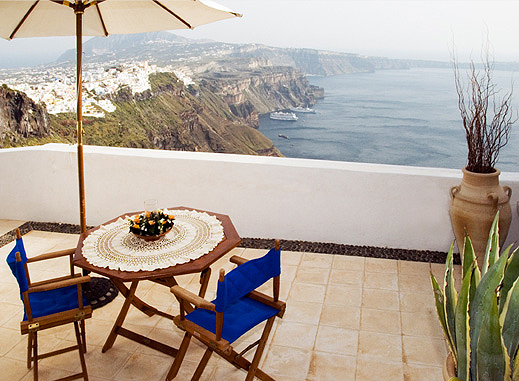 Calderaviews is locatedat Imerovigli, only a few minutes walk from the center of the island’s capital, Fira. The views over Oia, Thirasia, Kameni, Akrotiri and the spectacular Caldera will take your breath away. At Calderaviews you will experience an unforgettable stay at the most predominant position of the island… at the top of the world! Calderaviews was fully restored from its ruins in 2000. 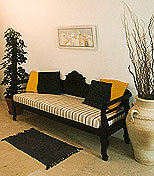 The renovation was based on the plans of a famous very well respected architect of the island, Norman Pless. Its architectural signature is unique, on one hand traditional and on the other contemporary. The breathtaking and uninterrupted views of the surroundings and the magnitude of the Caldera make you feel that there is nothing else but you and God! The Villa is a truly romantic get-away with south-west orientation, sunny all day, offering spectacular sunset and sunrise views from both verandas. Mouse over the images to enlarge! 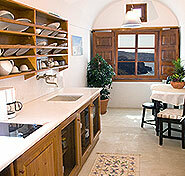 The kitchen is equipped with fridge, stove, coffee maker, crockery & cutlery, pots and pans. A curved rock staircase leads to the second floor where you will find a spacious bedroom with a large double king bed, cool white walls and tiled floor with an en suite bathroom with shower. Calderaviews ensures tranquility, privacy and convenience in a stylish way. It is the perfect environment for guests wishing to have a private retreat from which they can explore the island. Calderaviews is 120 square meters and it consists of two main bedrooms and one study room, often turned into another bedroom, one eating kitchen and one spacious sitting room; plus two verandas, one upstairs and one downstairs. The living room, the kitchen and the main bedroom with an en suite bathroom are located on the ground floor. The main décor combines the Mediterranean style with modern accents introducing a welcome, light atmosphere. The living room opens to the huge veranda, with white Greek travertine stone and an astonishing view with comfortable blue summer furniture, an ideal spot to enjoy your breakfast, meal or drinks. Following please find Calderaviews daily rates, booking seasons and an easy-to-complete form in order to make your on-line reservation. For a long term Stay during off-season months the rate is depending on the number of guests staying at the Villa. Ask for our special wedding packages! Santorini Island is a one-of-a-kind holiday destination that offers visitors impressive landscape and sea views, wonderful beaches and significant archaeological sites, making it the perfect holiday spot for all kinds of tourists. It’s no wonder that Santorini is considered by many to be the most romantic and spellbinding place in the world. What makes it so different from any other island? Caldera’s imposing landscape, the island’s impressionistic contrast of colors, its terrifying birth… to list only a few. From the first time you step on this island, time seems to stop and magic surrounds you. Thousands of visitors come to Santorini every year just to admire one of the most majestic sunset views in the world. The island has become a meeting place for romantic souls who have found a place that can only be described as the “poetry” of nature. Others visit Santorini for its exquisite archaeological sites, including the famous ancient city of Akrotiri, considered by many to be the last remaining piece from the Lost Continent of Atlantis, which was "swallowed" by the sea due to a volcano eruption 3,500 years ago, as well as the magnificent archaeological site of Ancient Thira, the splendid Cathedrals and the Museums (Archaeological, Prehistoric, Folklore and Maritime). On Santorini, you will experience the vacation of a lifetime, as no other island in the world offers such memorable contrasting colors and impressive scenery. Stark white villages built on dramatic grey and red cliffs, white and black sandy beaches, and a mysterious volcano. Nothing can prepare you for the uniqueness of Santorini, Greece. The "black pearl of the Aegean" welcomes you to a world of enigmatic beauty.